If you need to maintain proper pipe temperatures in applications that range from residential freeze protection to commercial maintenance flow-control processes, rely on the proven performance of EasyHeat pipe tracing products. EasyHeat, your industry leader in pipe freeze prevention and roof-and-gutter deicing applications, introduces PSR pre-terminated, self-regulating heating cable. Imagine the convenience: each PSR cable is a pre-terminated, off-the-shelf product with the efficiency and functionality of self-regulating technology. With this built-in application flexibility, PSR becomes a first-choice solution for your heat tracing needs. PSR is a parallel resistance cable with factory sealed connections. It is manufactured with water-resistant TPE outer jacket, UL Listed to Canadian safety standards and CSA Certified for ordinary locations. Rated at 5 watts per foot at 50ºF. 120 VAC models have integral three-wire plug with pilot light; 240 VAC models have three-wire pigtail. 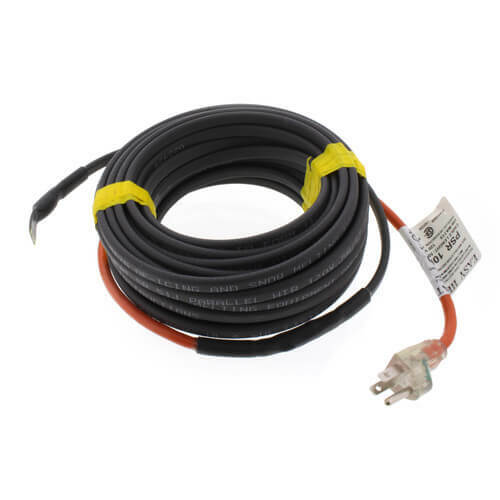 PSR 120 VAC heating cables have a power indicator light in the plug, visual assurance that the system is energized. Self-regulating heating cable means energy efficiency. The heat output is varied in relation to the ambient temperature. As the surrounding temperature increases, the heat output of the PSR cable decreases. But when the temperature decreases, the cable heat output increases and provides the heat needed along the length of the cable. The PSR system can be installed with the confidence that it will operate satisfactorily for years. When it comes to freeze protection, stay with the leader - Easy Heat.